Games & gaming accessories: Exotic boardgames, fancy die, starter and event decks, expansion packs, Magic: the Gathering rares, miniatures, rulebooks, deck sleeves and boxes, play mats. Toys: Pop! Vinyls, tokidoki blind boxes, action figures, lunchboxes, My Little Pony, blind bags. Comic books: Single issues to fill in a collection. Whether it’s a recent run of comic books, or something older, we can order back issues from our distributor or track down out-of-print issues from a variety of sources. 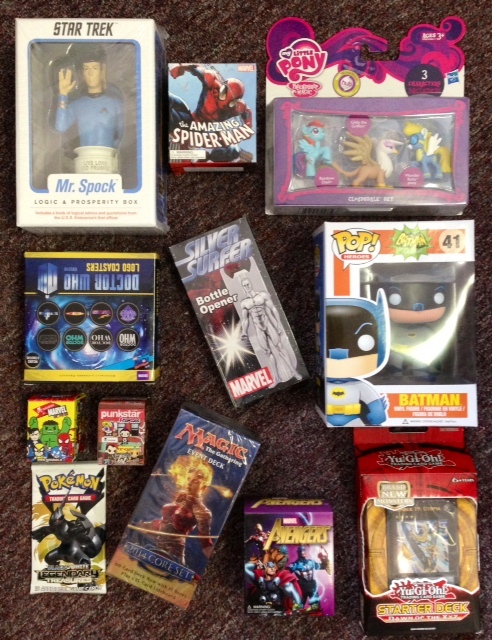 Recent collections we’ve helped fill are Silver Surfer, Star Wars, Trinity War, Villains Month. Variant issues: Some comic book series print issues with a few different covers, called variants. These are usually produced in smaller quantities than the regular cover and can become very collectible, and we’re happy to help track specific ones down. Recent variants we’ve tracked down are Infinity, Kiss Kids, Red Sonya. First printings: The first time a comic book has been printed. When a comic book is first produced, the publishers have to estimate the demand for that book. Once the book hits the stores and demand can be determined more accurately, the publishers will print a second run of the book. That first fun, called a first print, is often more sought after by readers, because they’re more rare. We’ve helped track down first issues of Doctor Who, Joker’s Daughter, Spider-Man. Trade paperbacks: Collected volumes of a comic book series. For series that have been around for 6+ months, we can order the story in a paperback volume, which typically collects 5-7 issues. Trade paperbacks are usually read when the comic book series is current and still being written/drawn. Some current popular trades are Saga, Morning Glories, Locke and Key, Walking Dead. Hardcovers: Hardcovers are collected volumes similar to trade paperbacks, but presented in a more collectible, attractive manner. Hardcovers either collect a larger volume of issues than a trade (10-12 issues vs. 5-7 issues) or are produced when a series is complete. In either case, the larger-sized pages displays bigger art and they look really nice on the bookshelf 🙂 Popular hardcovers in the shop are Earth 2, Y the Last Man, Walking Dead, Watchmen. Graphic novels: Contained stories within one book. Unlike trade paperbacks, graphic novels are self-contained stories within one book, and in most cases are available in paperback or hardcover. Popular graphic novels are Batman: The Killing Joke, Stephen King’s Dark Tower, Boondock Saints. Compendium/Omnibus: A massive collection of a comic book series. These are trade paperbacks on steroids, collecting 20-100 issues into a series, presented in paperback form or hardcover. Some of the more collectible versions of these are produced in an extra-large format, displaying the art beautifully, and come in a case. Please contact at the shop with any questions, or if you need help with suggestions and recommendations!